Connected audio in cars may be last year’s news, but the level of interactivity is challenging auto manufacturers to work with developers to create some pretty inventive applications. Enter Gracenote, an independent division of Sony, that collects data points on millions of songs and provides backend services that enable song recommendations to streaming services (for example). Now Gracenote has found a way to tap into the Control Area Network of a Ford Focus and use the data to create song recommendations based on the way you are driving. For example, when the windshield wipers are on, you might hear a bluesy tune to match the rainy road, but when you’re driving fast down the highway, your playlist may serve up a song like the Beach Boys, and high beams might trigger Ray of Light by Madonna. More than anything, this puts a whole new meaning on the “connected car” concept. 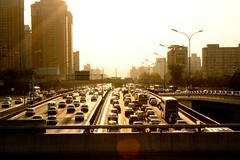 Your car is not just connected to the Internet, it’s connected to the weather, and traffic conditions and the way that you are driving. Really, you have to marvel at the concept (while you kind of wonder about it’s usefulness). 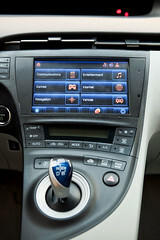 The connected car, once a concept, is now a reality and one that offers significant promise for the audience growth to online stations. One company that’s really driving the integration between your car and connectivity is Aha Radio. By the end of 2013, Aha will be installed into vehicles by more than 10 auto manufacturers which in total represent more than 50 percent of all cars sold in the USA/Canada and up to 30 percent in Europe. Using a cloud based platform, Aha lets the consumer organize their content on their phone and then integrate it with their car. Aha has content partnerships with more than 30,000 stations, including names like AccuRadio, Slacker, Rdio and Deezer. The also are integrated with innovative audio content from location based weather service Custom Weather to targeted content from Men’s Fitness and TV Guide, to Storynory, a service that offers audio content for children. Streaming news at CES 2013 last week was all about integration into cars, with big announcements from Ford and JacAPPS, Pandora and Chrysler, Livio, Tunein, and lots of others. The news about Sprint and Nextradio is big as well. Connected cars are a reality now, and Pandora has played a large part in that evolution. Pandora’s been concentrating on getting their service integrated into connected devices for a long time, and their efforts have had a very large impact. They’ve led a coordinated effort which can take a lot of credit for the high level of interest in connected cars at this year’s CES. Sure, lots of companies are enjoying the advantage of that increased buzz, that’s how it works – pioneers lead the way, open the doors, and others follow, and hopefully flourish. I’ve said it before and I think it bears repeating – the Internet radio industry has benefitted enormously from having a giant like Pandora in the space. They’ve generated lots of buzz and innovation that others have and will continue to benefit from in terms of listeners as well as technology. This Techcrunch interview with Pandora CTO Tom Conrad offers a nice overview of where they have come from, and how they do it.